Product management 102: is it for you? Mind the Product is a global community of product managers and enthusiasts. Its purpose is “to further the craft of product management by bringing together product people of all stripes”. They do this through their local ProductTank meet-ups, annual Mind the Product conferences, and public workshop training. Co-Founder Martin Eriksson describes product management as being “the intersection between business, technology and user experience”. This seemed familiar territory to me, though I’m a UXer and not a product manager. Keen to understand more I booked myself on the Product Management Essentials 102 workshop to delve a bit deeper (the 101 seemed rudimentary so I decided to jump right into the 102). I wanted to understand where product management differed to my role as a UXer and what new skills I could learn and add to my toolkit. Joined by product managers from the likes of Cisco and Financial Times, the one-day session was split into a favourite format of mine: a repeating cycle of theory, practical, case study and review. The day was based on a model we use at Red Badger - the Design Council’s Double Diamond model (repurposed as the Product Lifecycle for this workshop). It’s a way of working from a problem to a solution through a round of divergence then convergence. It’s great way of generating insight (diamond one) and ideas (diamond two) with prioritising/deciding tying the two together. We were given a case study to reference in order to populate the canvas which drew heavily from the Business Model Canvas developed by Alexander Osterwalder. 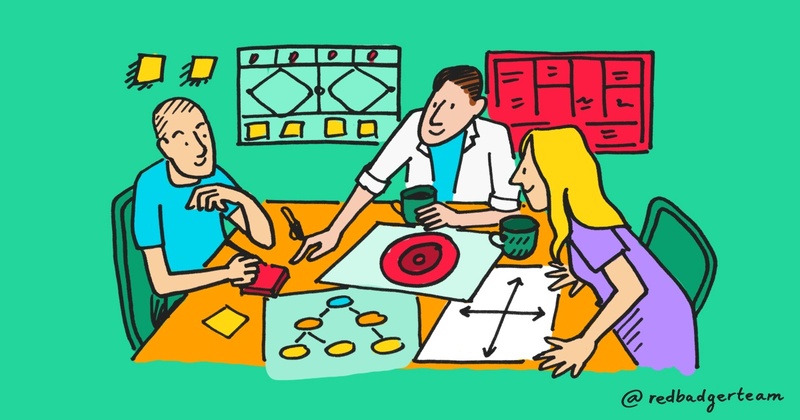 It’s a lo-fi approach to map, discuss, design and invent an organisation’s new or existing business model by aiding collaborative definition of key building blocks. It’s designed to be iterated upon. Here's the Red Badger team reinforcing their Canvas skills with Alexander Osterwalder and friends. Touching on techniques including focus groups; field research; diary studies and Ethnographic research, the Research Ops session focussed on Interview techniques. We teamed up within our groups and adopted the roles of interviewer, interviewee and note taker, questioning the interviewee about their news habits and taking notes on post-its. By writing a single note on each post-it it allows us to look at each nugget of information in isolation. Read more: Joe takes us through his approach to research with African farmers when developing the Haller app. Organising the nuggets helped us make sense of them. We identified insight; theme; opportunity and challenge from the output of the interview and put them into groups/themes. Read more: Sasha looks at how to organise lots of user data to get insights into the backlog. After considering several methods of prioritising including MoSCoW and Kano we used the 2x2 matrix of value vs effort to prioritise our themes. The quadrant to start working on first is high value / low effort as this would give the most amount of user impact with lower investment. Read more: Andy explains the benefit of prioritising with the 2x2 matrix. During the prioritising session, a fellow attendee spoke about the Opportunity Solution Tree. Popularised by Teresa Torres it’s a technique which takes us from desired outcome through opportunity and idea to experiments. Product teams can use the experiments to learn from. It’s a way of removing ourselves from a premature solution and to broaden our thinking to consider other ideas which could provide the outcome we desire. I’ve used a similar tool, Impact to Outcome Mapping by Jeff Gothelf for backlog creation. The strategic goal of the business is mapped against impact metrics and user outcomes. The outcomes are then used as goals for product teams to work on. These outcomes can be linked directly back to the strategic goal of the business and measured by the impact metrics, giving a product team a clear focus while adding direct value to the business. We rattled through this final session. Much of it was spent looking at different ways to create and manage relationships within a business. Think RACI and Onion maps. Attending this workshop reinforced the great work we do at Red Badger. At the time I was working on a discovery project for a high street restaurant and elements of the product management workshop reflected many of the activities we were running. Client, engineers, designers, delivery lead and strategy were personally taking part in all aspects of the discovery process from creating customer profiles and researching competitors to usability testing and analysis. Communication was extremely tight and we learnt vast amounts in four short weeks, validating hypotheses and putting forward our recommendation for delivery. As a UXer working on full lifecycle product development (through discovery and continuous delivery) I found little new to add to my toolkit from this workshop. If you work in a product team and you focus on the less broad parts of product development then this could very well be a workshop for you. If you’re an engineer who likes getting involved in usability testing or a UXer who enjoys working closely with code, check out our vacancies.